We left Emerson Vineyards around 10:00 a.m. or so for our 220-mile drive to Crater Lake. We've been keeping an eye on the forecast, and we have a few days of clear skies left and wanted to get to Crater Lake National Park before the clouds, rain, and possibly snow move in. When we visited Oregon in the fall of 2012, it was our plan to stop at Crater Lake as we headed south. However, just before our visit, heavy snow closed some of the roads, so we decided to wait until another time. And that time has come. Google Maps showed us a route taking us through Corvallis, but with my extensive, usually useless knowledge of where major colleges and universities are located, I remembered that Corvallis is the home to Oregon State University. Another quick Google search told me that they had a home football game today at 1:00. We usually don't travel on Saturdays, but when we do, I try to think of such things. So, we changed the route a little bit to avoid game traffic and that worked quite well. Once on I-5, we exited to get fuel just north of Eugene. I knew Eugene was the home of Oregon University, so I confirmed earlier they had an away game today. We pulled into a Travel America and realized they only had diesel fuel which would have been fine when we had the diesel truck with the fifth wheel, but it did us no good today. Linda drove to the Shell next door and pulled in behind another Class C motorhome. Turns out the Class C had broken down there at the gas pumps. Fortunately, Linda had left enough room to get around and we didn't have to unhitch the Jeep to back up. So far, she hasn't gotten us into a situation where we've had to unhitch in the time we've owned the motorhome since April of this year. After circling around again and waiting in line, we pulled up to the pumps, and I was just about to hop out when Linda reminded me "We're in Oregon" which means we're not allowed to pump our own gas by state law. Sheesh. Fueled up an back on I-5, we exited just south of Eugene and took OR Hwy 58 to U.S. 97. We made a stop to have some lunch at the Greenwater Park Rest Area on Hwy 58 at mile marker 36 before completing our drive. Driving over the Cascade Range and Willamette Pass on Hwy 58 wasn't too bad and the road is quite good and includes a good number of passing lanes. Our target was the Annie Creek Sno-Park just outside the south entrance to Crater Lake National Park. It's a large parking lot where you can camp for free. The Mazama Campground inside the park which is suitable for RVs closed in September, but on the park's "Lodging & Camping (Summer)" publication, it shows Annie Creek Sno-Park as an option and that it is free through the end of October. We pulled in and there was plenty of room. A group of three RVs had parked creating their own little compound, but they were the only ones here. So we positioned ourselves on a level spot where we could get the most sun. It's boondocking, but there are a couple of vault toilets and a warming shelter with a wood stove that is open year round. As soon as we got settled, I wanted to take a drive up to the Rim Village in the park. We're less than a mile from the park entrance and it was exactly 17 miles to Rim Village where we parked and got out to get our first look at Crater Lake. The sun was already low casting shadows on the lake, so we didn't get the "wow" factor I was expecting, but it was still quite a sight to see. 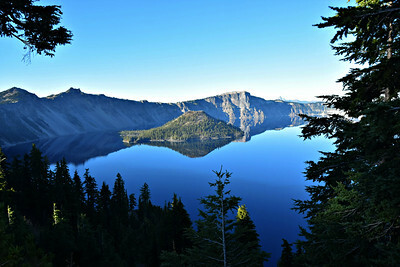 Most photos of Crater Lake include Wizard Island, which was off to the far left just out of view in the above photo. 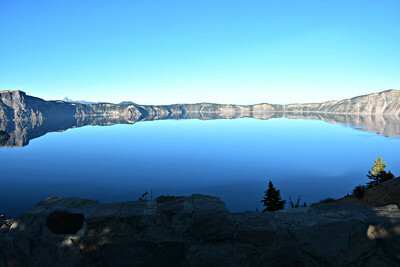 Crater Lake is the result of a volcanic mountain, Mazama, exploding and then collapsing an estimated 7,700 years ago. They think the mountain was around 12,000 feet tall before the eruption, one of the largest eruptions in history and way, way bigger than Mount St. Helens. The lake filled with rain and snowmelt as there is no perpetual stream or river flowing into it. It has a diameter of about 6 miles and it is 1,943 feet deep making it the deepest lake in the U.S. and the seventh deepest in the world. We're looking forward to returning tomorrow to drive the 32-mile loop around the lake, and then we'll do a little hiking the next day. We can now check off Crater Lake National Park as the 38th National Park we have visited, and our fifth new one this year. Visiting all the National Parks wasn't really a goal when we set out, but now I'd like to give it a shot. Thirteen of our remaining twenty-one are in Alaska, Hawaii, and California, and we hope to visit at least one more of the California parks before the end of the year. This has been an exceptional year for exploring, and we're not done yet.